Wow! Look at all you get! The theater itself, along with an audience, many performers, a carriage, and my favorites: the Gingerbread and Candy Cane Vendors ! 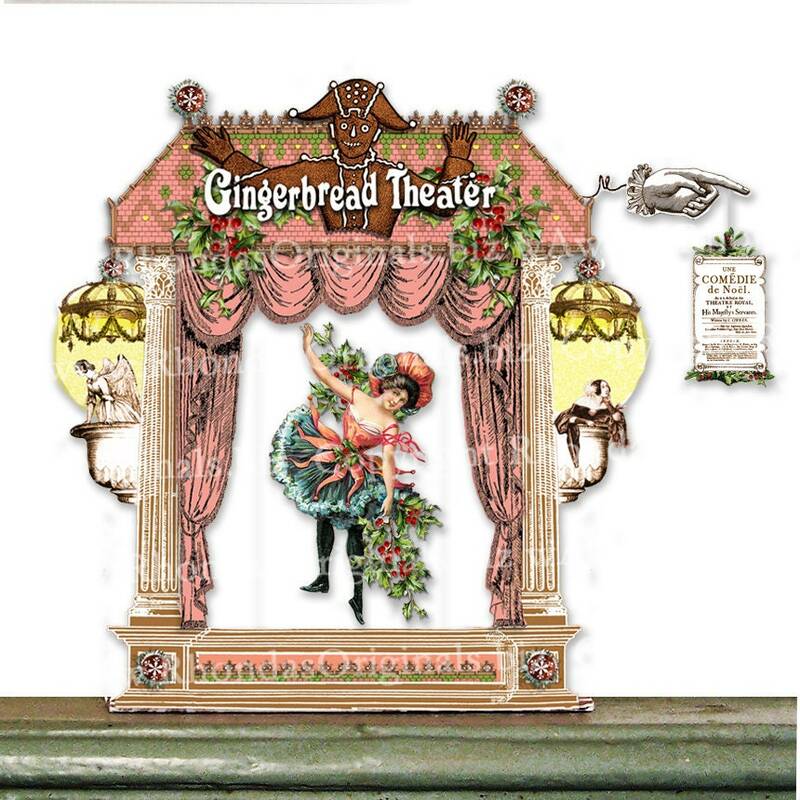 This 3D stand up “petit theatre” has some sprigs of holly for a subtle Christmas feel. But the colors are non-traditional peachy-pink so it can be enjoyed all year round. Interchangeable stage performers dangle from a tiny hook at center stage. The standing dolls consist of the Mouse Candy Cane Vendor the Bird Gingerbread Vendor, a carriage, and audience people / animals. Front side is in French and the back side is in English. Listing contains 8 pages of digital fun, plus full how-to instructions. Simply print them out onto card stock using your inkjet printer, then assemble. NOTE: Files are jpgs with a pdf how-to instruction file. For personal use only. Not for mass production. You can hand assemble and decorate a theater and sell the finished product on a small scale, but please do not sell the printouts of my files or share the files with friends. Please send them here to buy their own copies so I can continue to design fun stuff for you!